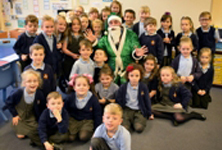 Pupils at two primary schools in Hartlepool were given early Christmas presents when Green Santa dropped in and presented them with a cheque for £250 after winning a competition. 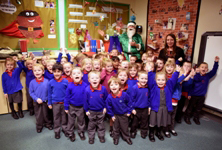 Pupils at South Gosforth First School were given an early Christmas present when Green Santa dropped in and presented them with a cheque for £250 after winning a competition. 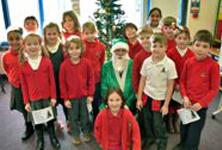 Year 2 pupils at St Cuthbert’s RC Primary School were given an early Christmas present when Green Santa dropped in and presented them with a cheque for £250 after winning a competition. Christmas has come early for North Tyneside resident Diane Vallely after entering a competition from local bus operator Stagecoach North East, and she is now the proud owner of an iPad! Five keen young engineers have taken the first step towards a career in mechanical and electrical engineering after being selected to join a four-year apprenticeship with a national bus company. Fifteen Movember supporters from Stagecoach North East’s Sunderland bus depot have shaved off their collective moustaches after raising money for charity throughout the month. With the countdown to Christmas now on passengers can take advantage of the extra bus services now on offer from South Tyneside to Newcastle and Gateshead for last minute shopping.